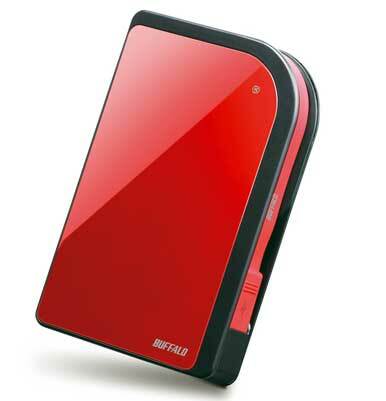 Buffalo gave its MiniStation line of portable hard drives a makeover. Now sleek, sturdier than before and available in multiple colors, the MiniStation Metro seems to be built for the rough and tumble lifestyle that demands both style and strength. Unfortunately, the USB-only MiniStation Metro pays a price for its rugged protective qualities and new facelift—the 250GB drive we tested posted timed trials that did not impress. The curved corners and shiny red exterior of our test unit (the MiniStation Metro is also available black or white) allows the MiniStation Metro to cut a more fetching figure than the black brick shape of previous MiniStation drives. The red exterior and more unconventional design are new to the Buffalo line of products, as the company has built a reputation on strong performance coming from simple style designs. The drive is a bit bulky, so it can fit into your pants pocket or backpack but your shirt would be in tatters if you tried to fit it into your breast pocket. While the MiniStation Metro resembles Iomega’s eGo ( ), Buffalo’s commitment to providing quality shock protection ensures that the drive is tough and portable. Buffalo highlights the MiniStation Metro’s new BumperBody shock protection abilities, even going so far as to depict an artistic rendering of the technology on the side of the box. For our wear and tear tests, I tossed the hard drive around my cubicle, dropped it from heights of over six feet, and eventually threw it against a wall. The unit showed no signs of abuse aside from the occasional scratch. In addition to the superficial makeover and important protection upgrades, the MiniStation Metro cleverly has an attached flex connect USB cable hidden on the side of the drive. The cord is a bit short, which is why Buffalo included a matching USB extender cable. While it’s nice that Buffalo had the foresight to anticipate users’ needs for a longer USB cord, a dual-USB cord that would draw power from two USB outlets would have been an even better edition. As a bus-powered USB-only drive, some older model laptops don’t have the power needed to spin the MiniStation Metro’s mechanism and often require a splitter cable to draw power from two USB outlets. There isn’t any packaged Mac software, though Windows users can enjoy log-in, backup, photo organization, and hardware encryption software. While not initially formatted for the Mac, the MiniStation Metro can be configured for Time Machine backup. The drive is covered by a one-year warranty and eligible for 24/7 tech support. The Ministation Metro finished our lab tests behind competing drives, including the older MiniStation TurboUSB ( ) from Buffalo. Both Iomega’s eGo Helium ( ) and the MiniStation TurboUSB finished our 1GB copy test around 53 seconds—the exact same time as the MiniStation Metro. The duplication tests were less impressive. The MiniStation Metro finished the test in 1 minute, 24 seconds, a full 5 seconds behind the eGo Helium and a whopping 9 seconds behind the MiniStation TurboUSB. The low-memory Photoshop tests were more encouraging. The MiniStation Metro finished only a couple seconds behind the MiniStation TurboUSB, and actually beat the eGo Helium by 9 seconds. The MiniStation Metro is priced at $90 and has a price per gigabyte of $.36. That’s comparable to the price (at the product’s release) of the MiniStation TurboUSB. It isn’t the cheapest drive on the market, but is reasonable compared to other USB-only portable drives. Buffalo has built a reputation on producing well-built, quality, and cutting edge products. While searching for an edge in the portable hard drive market, the MiniStation Metro gains an innovative design, but loses at bit in terms of performance. Users who care more about style than speed may still find the MiniStation Metro compelling due to Buffalo’s warranty, the drive’s impressive shock protective abilities, and the convenient, captive cable design.